One jeep with two owners or two jeeps with the same numberplate? 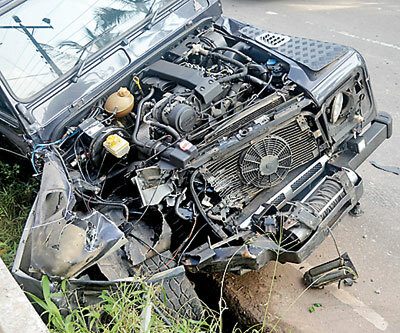 Breaking a week-long silence, Civil Aviation Minister Piyankara Jayaratne yesterday claimed a vehicle bearing the identical number of the Land Rover involved in a controversial hit-and-run accident on Monday had recently been sold by him to someone else and the transfer of ownership was in process. The explanation only raises more questions about the muddled matter. In the meantime, the two innocent victims of the crash are still in hospital, one in a critical condition. keeps murmuring the name of her sweetheart, Sachin, 18, unaware that he is battling for his life in Intensive Care. The boy lies unconscious, surviving only with the help of a life support machine after a Land Rover Defender registered in the name of Mr. Jayaratne crashed into him and Kavindya. Registration records at the Department of Motor Traffic revealed that the owner of the dual purpose Land Rover Defender bearing the number JB-7539 (the vehicle that crashed into Kavindya and Sachin) is Unnathi Piyankara Jayaratne of Isadara Madampe. Police media spokesperson Senior Superintendent Ajith Rohana however said there was confusion over the ownership of the vehicle and that the current owner was a businessman in Wellawatte. He said police could not release the alleged businessman’s name because investigations were continuing. Confusingly, however, police mentioned a second vehicle bearing the same registration number, and Mr. Jayaratne yesterday echoed that claim. “The original vehicle is owned by a businessman and the minister has already submitted the transfer form to the DMT. But when we visited the businessman’s house the vehicle bearing the number tallied with the one that met with the accident. The one that met with an accident bore a duplicate number,” SSP Rohana said. Minister Jayaratne and his Personal Security Officer yesterday added to this complicated evidence. The minister said the vehicle sold by him was with a businessman and that the vehicle involved in the accident had had an identical numberplate. The minister’s personal security officer, Inspector of Police (IP), Sahan Fernando said the vehicle bearing the number JB-7539 had been sold to a businessman through a car dealer in Battaramulla on December 9, 2014. The transfer of ownership forms had been handed over to the DMT, he said. IP Fernando said the Minister had told the Welikada police that there was another vehicle bearing the same number and that the vehicle involved in the accident did not belong to him. Police say they have placed on remand a student of Sri Jayawardenapura University who is suspected of involvement in Monday’s accident. According to SSP Rohana, this young man had sustained injuries to the mouth, making it difficult to record a statement. He has been transferred to the Prison Hospital, the Sunday Times learns. Bystanders sharply criticised the actions of the perpetrators who callously ignored the victims and simply concentrated on getting away unidentified from the scene of the accident. Manusi Kavindya and Sachin Prabash Tillekeratne had just alighted at a bus stop in Kalapaluwawa, Rajagiriya when two Defenders came at them at high speed with the front one hitting a truck and then crashing into the bus stop, residents said. 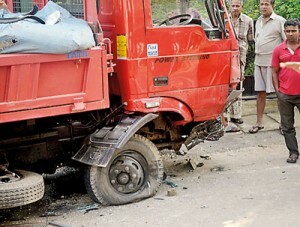 SSP Rohana maintained the second Defender had turned up only after the accident. He confirmed that men from that vehicle had taken away the driver of the first vehicle. Horrified witnesses told of how those in the second vehicle had dragged the injured driver of the first vehicle into their Defender and sped away without showing any concern for the young duo lying bleeding on the road. O.K.D. Chandrasiri, a resident of the area, said that the vehicles had come at high speed from the Ambagashandiya junction, 2km distant. “They were almost competing on the narrow road, and then we heard a loud noise. By the time we rushed to the scene the driver, who had received minor injuries, was being carried to the other vehicle and rushed from the scene while both the children were on the road. 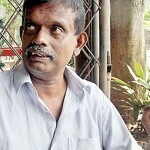 With much difficulty we got a three-wheeler and sent the girl to the Accident Service,” Mr Chandrasiri said. 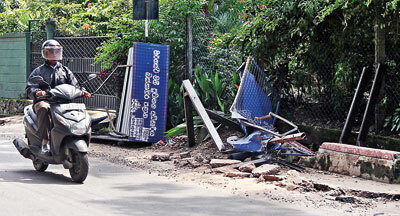 He said the boy Sachin was taken fully 20 minutes after the accident to Thalangama hospital in a police jeep. From there, he was transferred to the Intensive Care Unit. Another resident, who did not reveal her name for fear, said, “They were in black and white attire and the men in both vehicles were well-built males. They looked like security personnel or guards of a politician,” she said. Many residents in the area echoed the same views; there had been several political rallies in the area that day. “I was having lunch at about 2.30 p.m. when I heard a loud noise, thought it was a bomb blast and ran out. Those who were in the other Defender refused to take the injured children. Within minutes they left the place. The damaged Defender had liquor inside it,” another resident said. Kavindya, from Kalapaluwawa, will be sitting for the 2016 Advanced Level examination while Sachin, who comes from Malabe, has been studying to sit his A/L exams this year in the mathematics stream. Sachin’s condition is critical and has not shown much improvement, said Dr. Kapila Wickremanayake, the Director of Accident Service of the National Hospital. “He has undergone a laparotomy (a surgical operation to open the abdomen) and we found that his spleen is ruptured, causing severe bleeding in the abdomen. The blood had to be removed. He is also suffering from a head injury,” he said. Dr. Wickremanayake said the youth was suffering from increased intracranial pressure (pressure inside the skull) from the blow and that his vital signs were continuously being monitored. Sachin’s father, Mr S. Tillekeratne, said he had yet to meet the owner of the vehicle and that despite there having apparently been many men inside the vehicle no one had reported him to the police. “How can a vehicle travel at that speed without being stopped by the police?” Mr. Tillekeratne asked. “At least those men should have brought my son to the Accident Service along with their driver. His condition would have not been this critical,” he said in tears. Kavindya’s mother, Nishanthi Weerasinghe, said her daughter had leg and arm fractures. A complaint has been lodged with the Welikada police, she said. Many people who arrived at the scene had videoed the events on their phone cameras.